Low Acid Sampler | Reduce the irritation! A lower acid whole bean coffee sampler for our customers that cannot tolerate high acid coffees. If you experience frequent heartburn or acid reflux, our low acid coffees may allow you to enjoy a great cup of organic coffee without the irritation. Low Acid Coffee Sampler Pack has been added successfully to your wishlist. 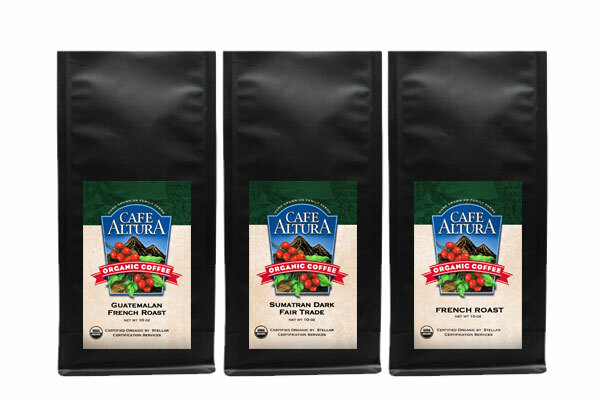 We are very pleased to offer a low acid coffee sampler pack for our customers that cannot tolerate high acid coffees. If you experience frequent heartburn or acid reflux, our low acid coffees may allow you to enjoy a great cup of organic coffee without the irritation. Want to know more about Acidity in Coffee? A little more on acidity - in coffee, it is a good thing! Acidity is a bright, clean element that adds to a coffee's flavor profile. Many of the world's highest-rated coffees are held in high regard in part due to their pleasant acidity. A coffee truly free of any acid would be dull and lifeless. Acidity in coffee also indicates the presence of organic acids, which are loaded with anti-oxidant properties.